A Feast for Crows is the fourth title in George R.R. Martin’s A Song of Ice & Fire series (aka The Game of Thrones). It seems too good to be true. After centuries of bitter strife and fatal treachery, the seven powers dividing the land have decimated one another into an uneasy truce. Or so it appears. . . .
With the death of the monstrous King Joffrey, Cersei is ruling as regent in King’s Landing. Robb Stark’s demise has broken the back of the Northern rebels, and his siblings are scattered throughout the kingdom like seeds on barren soil. Few legitimate claims to the once desperately sought Iron Throne still exist—or they are held in hands too weak or too distant to wield them effectively. The war, which raged out of control for so long, has burned itself out. “It was my feeling … that we were better off telling all the story for half the characters, rather than half the story for all the characters. Cutting the novel in half would have produced two half-novels; our approach will produce two novels taking place simultaneously, but set hundreds or even thousands of miles apart, and involving different casts of characters (with some overlap).”. Instead he chose to divide the books by character and location; thus A Feast for Crows and the latest title, A Dance with Dragons take place simultaneously with different casts of characters. Personally, I would prefer chronological rather than character/location because I find it easier to follow. 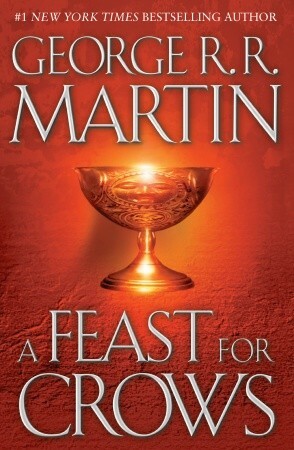 However, I am somewhat fortunate that I didn’t read A Feast for Crows when it came out in 2005, as I would have been waiting six years until 2011 for A Dance with Dragons. I have had it up-to-here with Cersei and cannot wait for her to get axed. Although Cersei will probably manage to live for a while, knowing Martin’s penchant to kill off character just as you begin to empathize with them. She flip-flops between who she holds in high regard, and while she thinks she’s ruthless and cunning, she’s slowly killing the kingdom. I hope we see Tommen come into his own soon. With little Queen Maergery around, we’re beginning to see some of Tommen’s personality, although it is mostly just parroting. Sometimes I just wanted to give Brienne a slap in the face. She is loyal but overly trusting, and sometimes just plain slow. She doesn’t have many survival instincts with conflict, and sometimes you feel really bad for her because she just tries to do her best but she doesn’t have the cutthroat attitude to make it out in the real world. I was curious to see where her quest for the “highborn girl of 14, with red hair” (aka Sansa) would end up, and I was quite surprised. It is an interesting turn of events that Catelyn is now Stoneheart, and since we haven’t really seen much of Catelyn, I’m curious how resurrection will have changed her mentally. I found it most difficult to follow the political stuff in the Iron Islands, first because they’re mostly new characters, and second because they feel so far removed from the rest of the conflict. The same can be said for Dorne and the political conflicts there, and Princess Myrcella. I was finally not completely peeved with Sansa—she seems to actually understand nowadays how to survive, even though she still needs a ‘protector’ of kinds. She’s naive and still overly trusting, but at least she’s not a ninny. I think it’s interesting having her change persona as a parallel to Arya’s change of character. Arya, of course, I love. She’s spirited, determined, and a risk-taker. Her sections are always compelling and exciting, even if it’s mundane activities. It was nice to have Samwell’s view, as we haven’t seen him much except from Jon Snow’s viewpoint. Although I am curious to see what is happening on the Wall as well as with Daenarys.